Mark Armstrong was a little boy, perhaps no more than five years old, when he learned that his father, Mark, Sr., was a fine basketball player at St. Peter’s Prep and later Rhode Island College. When the time came for the younger Armstrong to learn about the game of basketball, he didn’t have to look far for a tutor. The lessons between father and son didn’t end on the court. When the time came to choose a high school, the younger Armstrong didn’t think twice. He was going to attend his father’s alma mater. “I thought about some other schools, but I was very comfortable at Prep,” Armstrong said. He attended the school’s Higher Achievement Program (HAP), which has been a staple at the school during the summer months for aspiring grade school students. “That definitely got me ready for high school,” Armstrong said. 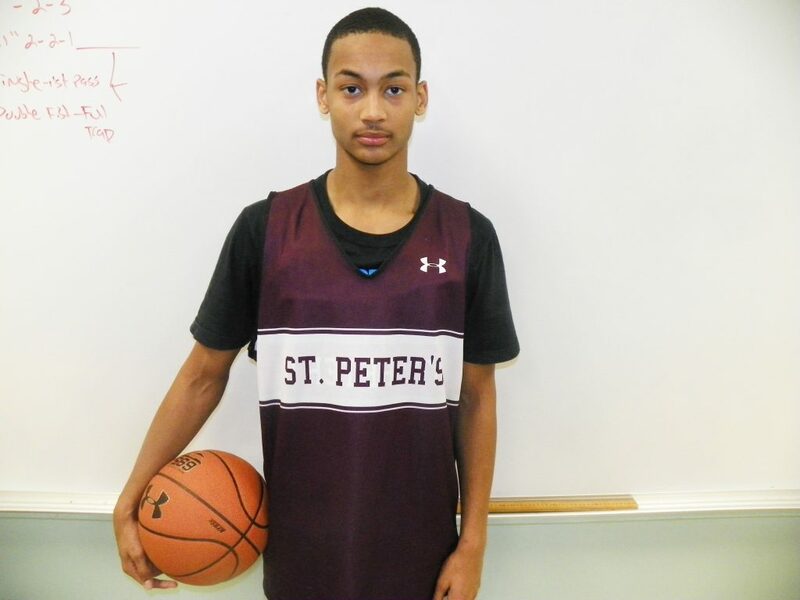 It was while he attended the HAP program that Armstrong caught the eye of St. Peter’s Prep head coach Alex Mirabel. So when Armstrong entered the halls at Grand and Warren, he was thinking he would be a part of the sub-varsity. “I didn’t think I would play varsity,” Armstrong said. As it turned out, Armstrong not only made the Marauders’ varsity squad right away as a freshman, but he became a vital component to the team. “He’s the most skilled freshman we’ve ever had,” said Mirabel, who also coached 1,000-point scorers Brandon Thiele (now playing basketball at Army West Point) and 2017-18 Hudson Reporter Male Athlete of the Year Shayne Simon (currently playing football at Notre Dame). Both Thiele and Simon started as freshmen, but in the eyes of Mirabel, Armstrong is a better player. Mirabel is also impressed with the elder Armstrong. Recently, the younger Armstrong has emerged as one of the top all-around players in Hudson County. It started when he made a layup with just two seconds left to give the Marauders a stunning 45-44 victory over seven-time defending Hudson County champion Hudson Catholic, the Marauders’ first win over the Hawks after 14 straight losses dating back to 2010. Armstrong’s solid play continued when he scored 23 points against Kearny, scored 24 vs. Dickinson, scored 16 against Union City and had a season-high 25 against Bayonne, all four games Marauder victories. And for his efforts, Armstrong has been selected as The Hudson Reporter Athlete of the Week for the past week. Armstrong said that he learned about having poise and composure at a very young age. Armstrong said that he had no idea what his scoring average was for the season. It currently stands at 18 points per game, easily the top scoring mark in the history of Prep. Armstrong is bringing back memories of two great Prep freshmen, namely Keith Lumpkin and Kevin Walker, both of whom started as freshmen for the Marauders when St. Peter’s won the Hudson County Tournament championship, the first of three straight county titles. Both Lumpkin, who went on to play football at Rutgers, and Walker, who had a brilliant college basketball career at Caldwell College, earned Hudson Reporter All-Area honors as freshmen. Armstrong is well on his way. Armstrong has already passed the major test – the one that comes from his old man.